The event that HTC has planned for February 19 is getting closer and closer, and it looks more and more clear that we are going to see the launch of HTC’s new flagship device. 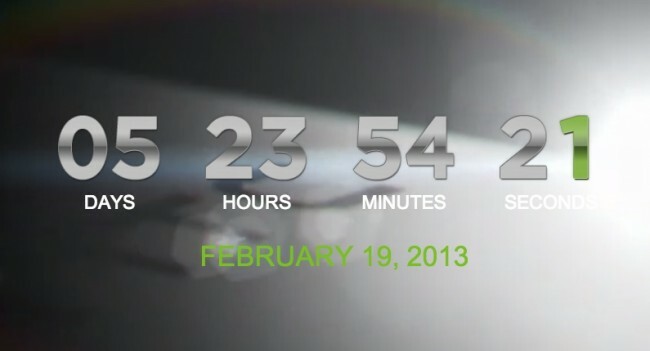 The front page of HTC’s website has been updated with a countdown clock that points to their event next week, but also hints towards their new device being named the HTC One. Each time the timer gets to a :01 interval on the countdown the screen flashes and you catch a glimpse of the unannounced device in the background in a short clip. Hints of the phone’s backside, side-profile and camera can all be seen if you watch it long enough. It isn’t much, but HTC seems to be hypebeasting their upcoming flagship pretty well. Are you at all excited for what HTC has to announce next week?